*Creation Stories make up one of the largest segments in the pantheon of mythology. We tell them to help make sense of the world. Everything about August 23rd, 2018, the birthday of our son, Callan Douglas Rickman, was fast. One moment there’s a baby inside you, the next he’s part of this world. I went to the doctor at 8 a.m. expecting to have a checkup and return to our hotel to continue waiting. We were staying in a hotel in Cancun. Living on an island makes natural births a bit tricky. If he came during the day while the ferry was running, fine. If he came at night and we had to contact friends with a boat for our emergency ride to the hospital, things were a bit trickier. We opted for less error room, and stayed in Cancun. Callan was already two days overdue, but that’s not uncommon for first pregnancies and I’d decided I didn’t want to induce yet. I was calm, sure of the appointment’s outcome. I was going to have a natural birth. I’d read my chosen material about natural childbirths and I was prepared. 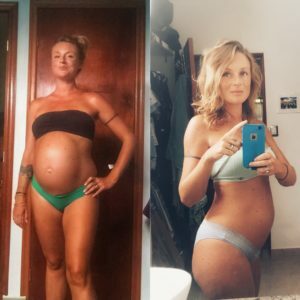 I’d researched yoga to help natural birth, and it became my weekly routine. I made my birth playlist on Spotify, carefully choosing songs I might want for moments of calm and moments of pain and moments in between. I bought a beautiful bathrobe and I imagined myself walking the hospital halls in, because I’d read how much walking helps the birth process, and I was going to walk. Our friend Amber was scheduled to participate as my doula. 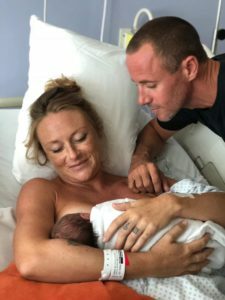 Her youngest son was born at home on Isla, and I knew her “no-nonsense but chill and calm” presence would be helpful to Ryan and I.
I was determined to gently but firmly tell the doctors “No” if they told me I needed a c-section. I’d done the research on the rising prevalence of c-sections in both the U.S. and Mexico and I wasn’t going to be one of those statistics. I’d heard story after story of women on Isla and Cancun who were told tales of the cord being around the baby’s neck, etc. in order to coerce a c-section. 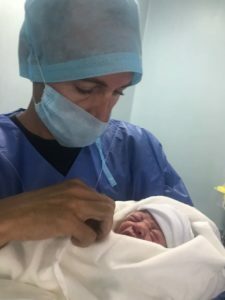 Many doctors here and in the states like c-sections better than natural births and the rising rates reflect that (a whopping 80% in parts of Mexico) because they can charge more and, medicinally, c-sections are far less unpredictable. A natural birth has so many unknowns, and they take a long time, utilizing more hospital staff and utilities. I knew the statistics and wasn’t going to let that happen to me. After my sonogram, we reconvened with our doctor, who calmly explained that a c-section was necessary because my amniotic fluid levels had dropped to a 5.8, and 8 was the lowest, safest level. In addition, I wasn’t in labor yet, and inducing could further the risk of harming baby Callan. Our doctor was speaking through an interpreter, at the same time I was struggling to understand her Spanish. It took a moment for what she’d said to reach me. I couldn’t, wouldn’t have a c-section. That wasn’t what was going to happen. It hadn’t even entered my mind. I’d prepared myself for other potential medical interventions and had planned for how I would accept them, or not. I hadn’t done any research on c-sections because I just wasn’t going to let that happen. I knew nothing about the procedure, recovery, etc. Nothing. When I heard the word “c-section” I conjured ideas of this birth method being somehow easier than labor. You schedule a c-section like you schedule a haircut, I imagined, while labor was labor, and therefore a sacred, ancient struggle I was absolutely going to experience. As the news sunk into my whirling brain I stuttered protests, looking back and forth between Ryan, the doctor, and the interpreter. 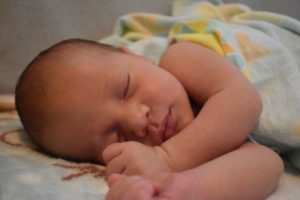 Everything kicked into overdrive as I processed the idea that my need for a natural labor might harm our child. This fear was mixed with the feeling things were moving out of my control and exactly the kind of manipulation I’d so feared was taking place. 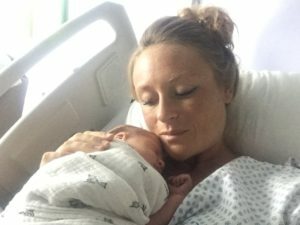 Fear for the safety of our baby boy won out, and before I could take a breath I’d been whisked behind an emergency room curtain and was being processed with countless forms, dressed in scrubs from head to toe, and asked to remove my body jewelry, some of which hadn’t been taken off in over a decade. I couldn’t stop crying, and was furious at being rushed. Ryan was caught between my emotion and the staff peering around the curtains, trying to accomplish what they’d been tasked to do. “I haven’t called my mom yet,” I sobbed. “It’s too fast. Please. Tell them I need time to process.” I said to Ryan and anyone else in the room at the moment. The IV tech looked at me with mixed sympathy and incomprehension at my tear-garbled English. The pressure to move forward became too much, and after a calming call to my mother, I succumbed to various pre-surgery procedures. An epidural is a uniquely deep and sickening pain. The needle to my spine made me slump forward in agony as blue scrubbed staff hummed around the room, preparing for surgery. I didn’t know an epidural was necessary. I didn’t know what an epidural really was. My legs went numb, and I was trapped in my body, knowing nothing of what was to come. The medications were setting in and I became frantic just as Ryan appeared in the doorway, dressed in blue scrubs from head to to. It wasn’t supposed to be this way. I was supposed to go home this morning. Thumped through my head as the anesthesia settled in. Everyone spoke Spanish, and mine isn’t good enough yet to understand, so whatever was about to occur remained a terrifying mystery. Ryan’s hand on my head was an anchor. I remember the cutting. I remember crying out that I could feel it, but Ryan says that didn’t happen, so it must’ve been the medication. I bobbed in and out of consciousness, bits of Spanish and strange sensations in the numbed place that was my womb. Our baby’s cry pierced the haze and I was alert instantly. They placed him by my head and his cries ceased for a moment. Baby Callan moments after being born. Baby Callan with his daddy. And then he was gone, and Ryan was gone with him, and I was alone with strangers in the operating room, feeling stitches pulling in and out, in and out deep in my center. I focused on breathing and finding a place of calm. I conjured my childhood home in Michigan. Out of body, I could see us gathered around the dining room table—place of a million remembered meals with loved ones here and gone. Momma, dad, Laurel, Ryan, and this new baby I’d met for only a moment were there. I grabbed that place and held onto it. It was real, and it was joy, and I was going to get there. When the blue sheet lifted, I was wheeled into the recovery room—a purgatory I have difficulty describing. Two hours without my baby. Two hours alone, unable to move from the waist down, in a bed behind a curtain somewhere in a Cancun hospital, bobbing in and out of consciousness. In moments of clarity I asked the nurse on duty for the time. Over and over. When finally wheeled into my hospital room, it was empty. Anger, fear, frustration, anxiety, sadness, surged through me. “Where’s my baby and husband?” I gasped as the nurses lifted my inert, numb body from gurney to hospital bed. “Una Momenta,” they said, and I tried to steel myself for another wait. My friend Amber appeared, and her welcome presence was a distraction from the anxiety, waiting, and reality of my physical body and all that had just occurred. She was also a reminder of my failed attempt at a natural birth. We’d talked over the details so many times, for nothing. My body hurt in a way reminiscent of appendix surgery, but far, far worse. Nausea surged through me. I fought it down, but knew the battle would be short lived. Soon I was vomiting into a plastic bag, tears streaming down my face as I tried without success not to strain layer upon layer of new stitches. When the door opened I leaned toward them, my boy and my man. They brought him to me and all the oxytocin in the world seemed to surge through me as I held Callan’s tiny self against my chest. I reeled with the reality that this tiny being had just been inside me and was now here in my arms. He’d grown in me, and now was here. He cried and I exposed my breast, ready to feed him. 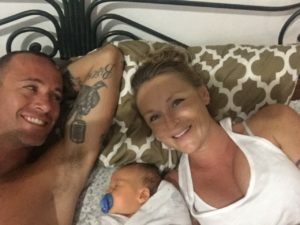 I was determined to master breast feeding, especially as labor had been denied me, and due to a combination of luck and determination, he latched right away. I heard the door click shut and it was just us three. A universe. In the days and weeks that followed I made a slow, halting recovery. I was still in deep shock at how quickly things happened and the toll the operation had taken on my body. The pain was like nothing I’d ever experienced, and I fought it day and night. At first I needed help showering, dressing, and many other day to day activities, but gradually movement returned. I’ve spoken with many women who had both c-sections and natural births and the conclusions I’ve drawn are that no birth is easy and every single one is different. I set my expectations too high and didn’t allow myself room for all the myriad factors involved in childbirth. Best to be prepared for everything, although that’s a good thought in theory, but harder in practise. Some part of me is, and always will mourn the experience I didn’t get to have, but I’m healing and my son is healthy and was from the moment he was born, and for that I am deeply thankful. I didn’t appreciate them before I had a child, but I now love stories of pregnancy and motherhood and wish I’d paid more attention before my own experience. Each woman, child, and story is its own, but there’s an ancient symbiosis running through them all that reveals the strength and sacrifices of Women; what our minds and bodies can endure; and the incredible-strange-terrifying-wonder of making a human, and bringing them into the world. The female body is truly miraculous. These photos were taken within a week of each other. I don’t consider what follows to be poems, necessarily, but short lyric essays based on my remembrances. I also want to note that many women have c-sections and do not have the negative experience I went through. Many women I’ve talked to who had a natural birth experienced similar traumas. Each woman’s experience and story are her own. I think it’s important, necessary, and sacred to share birth stories. Not just with mothers either. By sharing these stories we dispel many of the negative myths surrounding childbirth that have steadfastly held on for hundreds of years. Split open and the world came out. Not the pushing-sweet-agony I’d prepared for. The stretching, yoga breath, reading, meditating, labor playlist. Instead, a confusion of tears and IV pokes. Half explanations in Spanish and broken English. Panicked calls to momma in Michigan. My husband’s worried blue eyes. Hospital cap, gown, and blue booties. Remove nose ring, earrings, rings, toe ring. Wheeled gurney rides through confusing corridors and no time to prepare. Not the spiritual push-shared-pain moments of women across time. Instead, bone-deep-agony epidural spinal tap. Husband’s hand on my forehead the only calm. Pain medication blurred fade in and out. Baby cries and I’m awake, a need so internal pulling my numbed and open-wound body to the sound. They put him by my head and the world narrows to his face. His cries quiet. A moment, and he’s gone, husband with him, and I’m alone in a room with strangers speaking a language I don’t understand, sewing my womb back together. Consciousness is an elusive doorway I pass back and forth through. I’m frantic for my baby, lying in recovery, numb from waist down. I pinch my thigh and feel nothing. The longest two hours of my life slump by. I exhaust the nurse with requests for the time. An eternity of seconds, and I’m wheeled to my room. More waiting, aching, IVed, stitched together. Anything, for an opening door. 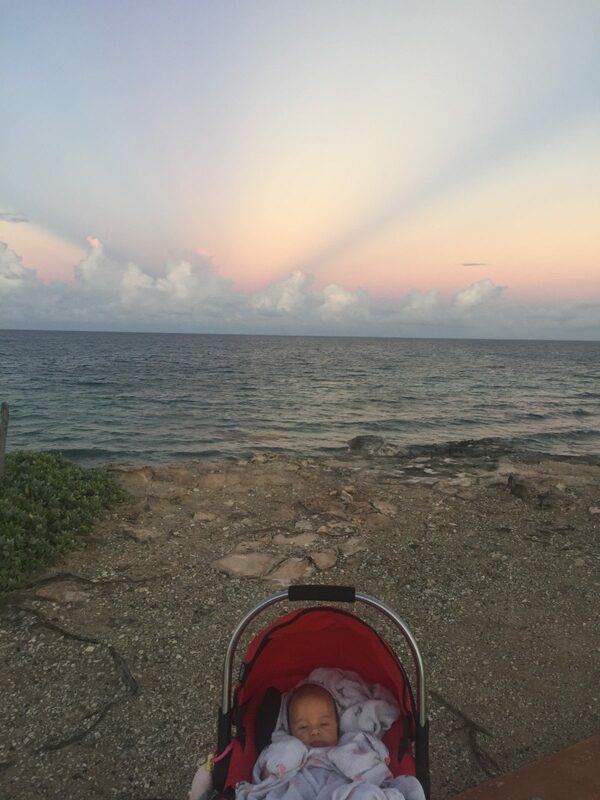 Then he’s in my arms and there is no room, no world, only my family; a tiny universe in this hot Cancun city. We trace every detail. Again and again. Put him to my breast and he nurses like we’ve done this forever. The medicine makes me sick, and I throw up again and again—searing pain makes me moan and retch. My shrinking uterus makes me bleed. 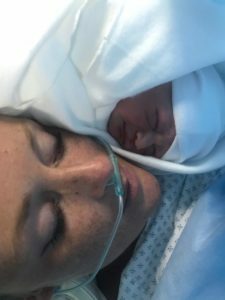 Unknown and painful revelations, beginning recovery, for a c-section that was never supposed to happen. It blends—the pain and ecstasy. I gaze at him with the eyes of all mothers before—in wonder and awe at this being my body housed; my Body created. How many times do you lean over the crib to make sure he’s breathing? Touch his chest, gently lift a hand, run your fingers over his tiny head? How many times do you cup your palm behind him to steady a neck not yet strong enough without you? How many times do you tickle his cheek, hoping for the elusive “new baby” smile? How many times do you pace the floor, arms leaden, back aching, searching his face for signs of sleep? How many times do you hum and sing that song? How many times do you remember these moments are temporary, no matter how many times repeated? The beautiful bits of life are steeped in sacrifice. The ancients knew this—sacrifice motifs woven into mythology from the ancient Greeks, to the Bible, to Australian Aboriginal tales. A friend recently send me photos of my former cabin and the family that lives there now. The lovely work they’ve done. Changes. The pictures are beautiful and make me both sad and joyful. They show what I would’ve done, if I could’ve, would’ve, stayed. I look down at my son and think about the life I sacrificed to have this life with him. A life in a cabin in rural Upper Michigan—a home I know so well. It’s sad, and true, and beautiful, and necessary. All other incarnations of Rachel sacrificed when I became a mother. Lives unlived for the sake of this wondrous new life for my son, his father, and myself. I’m learning that to be at peace, I have to let those other Rachels go. The independence I once wore like a second skin making room for the love and need of a husband and son. My joy in being alone set aside for a while as I nurture this new little life. My body now a shared entity and food source for our baby boy. Some nights, half asleep in my nursing chair, Callan at my breast, I close my eyes and wander down other roads, conjuring Rachels of the past. I linger and reminisce there for a while. Baby’s soft sigh and smile tug my heart home. Ryan lifts his head from the pillow and smiles at us—his wife and son. And once again there is only this room, this moment, and this road.